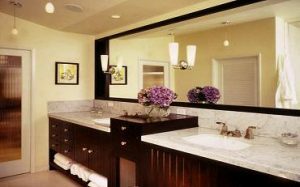 Are you looking for bathroom renovation ideas? DeVrye Renovations has just the information for you. 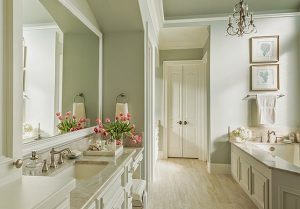 We have compiled a list of our top picks for stunning bathroom renovation ideas from leaders in bathroom design and renovation forums around the internet to help get you started on your research for your ultimate bathroom. DeVrye Renovations has served the Kitchener-Waterloo region for over 20 years. In that time, we have renovated over 1,000 homes and we are always doing more. Our team of professionals prioritizes cleanliness and quality work so you and your family can rest easy during the renovation process. To learn more about us or to get started on a project, feel free to contact us! This bathroom really uses light to its advantage. With the reflective tiled wall, mirrors and a large window, this bathroom is guaranteed to look breathtaking during the day. At night, carefully picked lights can be turned on. A large pendant light helps to provide a main source of light. The different textures give the bathroom a sense of effortless elegance. While a smaller space, this bathroom is able to pull off a very flattering look by keeping the heater exposed and using tall pieces. A guaranteed way to make your bathroom shine is by using its shape to your advantage. This larger bathroom uses its long shape to include a stunning mirror and a jacuzzi bathtub for added comfort. Storage is restricted to the side to make way for bathroom traffic. 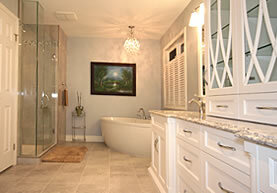 The white tones help provide the illusion of space to make the bathroom even more luxurious. This bathroom demonstrates what double the space can mean for a bathroom. With two sinks couples, in particular, can enjoy their bathroom time without getting in each other’s way. The clever storage on the side leaves towels free from the confines of drawers for ease of access. One interesting feature of this bathroom is its mirror mounted lights, which help to add extra light through reflections and solve any problems this bathroom may have had with space for lamps and other light sources. This is one of our best bathroom renovations since it pays attention to space. In a bathroom, it is extremely important for everything to be spaced properly. Too far away and it is no longer convenient. Too close and it is cramped. 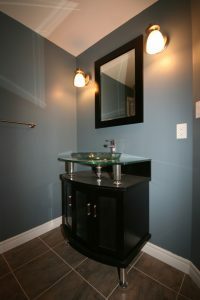 The use of a free standing bath near the window and an open concept vanity help to create space where there is usually none. Click here to see more testimonials from our customers! Bathroom trends nowadays are pushing how far people are willing to go for minimalism. 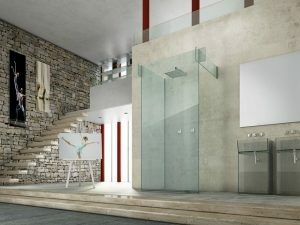 Shower designs, in particular, are going through a revolution of sorts with their different setups and mechanics. This shower has very little mechanically. Without even a door, it provides a level of sophistication that a typical shower may not always be able to produce. Who said showers had to have sharp edges? This shower throws all convention out the window by using a spiral design. From the details painted on the ceiling to the glass barrier on the side of the structure, this shower creates a unique and relaxing experience by incorporating several different shower heads, overhead lighting, and even a bench to sit on and lather up, or maybe just to dry off. Few showers venture in this direction but when they do, the result is worth it. 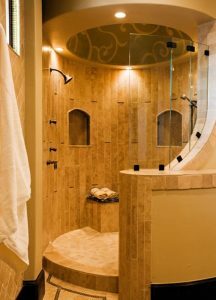 Our shower design here complements the depth needed for this shower by drawing attention to the back rather than to the front. By making one wall patterned, we integrated modern design by keeping balance in mind. This shower is not your everyday walk in- it is an experience. 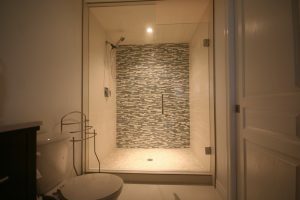 We kept the shower head simple to draw less attention to it and included a light since the shower is out of the way of the rest of the bathroom. We loved this bathtub for its fresh take on the jacuzzi design. 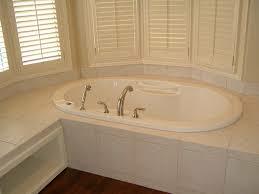 While jacuzzi bathtubs can be bulky, they are stunning if used in the right way. 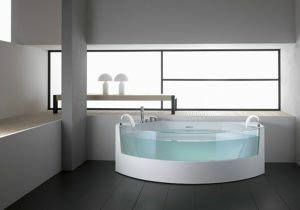 This bathtub’s top half is glass to let you see the water level, which is a safety and aesthetic feature. Jets pump water in an arc from the sides rather than having the jets lower down. The result is an instantly relaxing atmosphere. Our full bathroom renovation of a local home featured an impressive bathtub section that we wanted to share with you. The best thing about this bathtub is its seamless blend into other parts of the room. The California shutters allow the user to have privacy while still getting some light. We also included storage under the bathtub to make it easier to reach a towel when you get out. Sinks will often focus on what is being put on them but what about underneath? 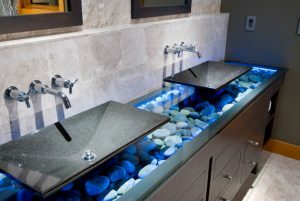 This set of sinks uses a rock display to add depth to an otherwise standard design. It is very important to think about all layers of your bathroom, and this sink definitely illustrates how going the extra mile in your thought process can benefit the overall look of your bathroom. 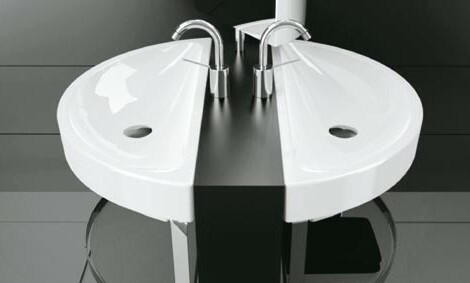 This sink takes double sink design to new heights with its unique concept and division of space. For people who are looking for a way to incorporate a double sink without it taking up too much room, this design is your answer. Complete with storage below for towels, soap or other products, it uses a modern look and sleek surfaces to perform effectively. Sinks are often hidden within vanities and counters, so we loved doing this sink design to change things up. We used a glass on glass look to draw attention to the different layers of the sink and deconstruct the item. Being able to see the inner workings of an object is a design idea readily available for bathrooms, and sinks are an excellent place to start. Incorporating contrasting materials into your bathroom can create a very flattering sense of timelessness, which is demonstrated in this vanity. Sleek marble and rough wood are used here to reflect their position in the structure. The marble counter is sturdy enough for products and even plants while the wood can handle being opened, closed and knocked. This vanity struck us as unique for its deconstructed use of the different parts of a vanity. First is the sink, then the counter, then the decor. 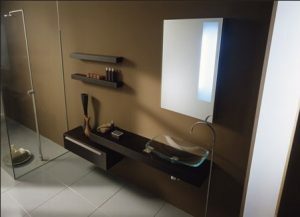 It cleverly prioritizes the parts of a vanity while still being easy to access. 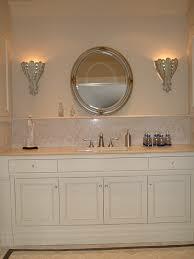 The vanity can also act as a type of shelving if you want to get creative with its possibilities. We also love the extended tap that comes up from the ground, which brings the whole structure together. 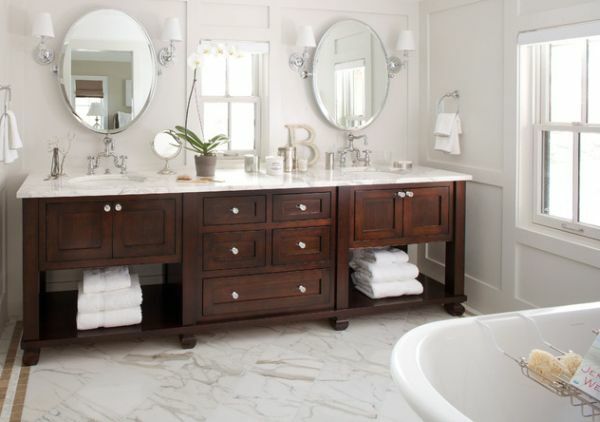 Our vanity renovation uses calming, natural materials to complement the relaxation expected in a renovated bathroom.